The following originally appeared in the September 17 edition of the Tooele Transcript Bulletin. From the top of Deseret Peak in the Stansbury Mountains, the communities in Tooele Valley look like tiny collections of etched traces and capacitors on a vast computer circuit board. That was one of my first impressions of the view when I crested the 11,030 foot peak last summer. There’s a reason why topographically prominent peaks—called “ultras” in peak bagging circles—are the most sought after summits. In addition to elevation, ultras have high independent stature. So they offer the best views and the most tangible sense of isolation. 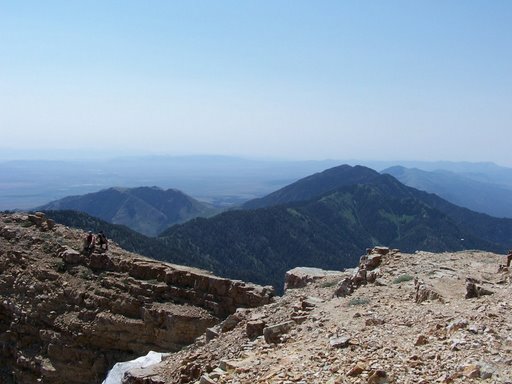 Deseret Peak is one of just 57 ultras in the lower 48 states. I had driven 8 miles up a canyon and hiked 3.25 miles, climbing 3,613 feet via switchback and rubble fields to reach this jagged quartzite platform. If I wasn’t on top of the world, I was sure close. Exhausted and satisfied, I threw down my pack and sat at the edge of the summit to ponder my feat. After chugging a bottle of water, I reached for my cell phone, which doubled as my watch. As I turned it on, I was surprised to see that I had full service—both voice and data. Instinctively I checked my email. Then I called my wife, Googled some information about the return trail, checked my work email, and read the latest news. By this time, my hiking companions had also discovered this miracle of connectivity and were calling spouses and dialing up info too. Others were busily checking pedometers, shooting video, and programming GPS receivers. For a little while, Deseret Peak was a regular cyber café. While the knowledge that I had this technological lifeline in one of the most remote and dangerous places in the county was truly a comfort, I felt like the whole internet part of it was somehow wrong. Not morally wrong, but out-of-place wrong– like listening to Christmas music in July or drinking milk from a Coke can. I couldn’t help but feel like I had violated some unwritten outdoor code. Part of me wished I would have left the phone on my belt. The other part spent a good chunk of the return hike wondering what other cool gadgets I could employ in the wilderness. Aside from my wife, Meadow, I have two other loves: the outdoors and technology. Regular readers of this column are no doubt aware of the first. And when I’m not outside (or at work or changing diapers), I spend what little free time remains in front of a laptop—shopping online, reading news, and drooling over electronic gadgets I’ll never be able to afford. Meadow says I’m addicted to computers, to the internet, to my phone. I assure her I can stop at any time, that I’m in complete control. She remains unconvinced. Despite what some may think, technology and the outdoors often complement each other nicely. I blog, Facebook, and tweet—mostly about the outdoors. I do most of my research online and I get many outdoors ideas from online forums. In the field, who can argue against the benefits of GPS and the ability to call for help in emergency situations? And if you can check email and stream YouTube– all the better, right? Some outdoor purists consider these assets as cheating. They argue that wilderness should be experienced solely on its own terms. The tougher the mental and physical challenge, the greater the reward. I get the idea, but I wonder if experiencing nature in full is always practical or even desirable. The great explorers and pioneers were more in tune with nature than I’ll ever be, yet they probably would have given anything to enjoy modern technological conveniences. We casual adventurers sometimes forget that while our predecessors enjoyed the wild, more often than not they were there out of necessity, not hobby. They aimed more to survive nature than to fawn over it. Still– if only at the subconscious level– their connection with the mountains, trees, and trails must have given them a certain fulfillment that the modern outdoorsman can only attain in fleeting bits and pieces. I’m not an ideologue when it comes to these matters. If my goal is to experience nature in the raw, I ditch the gadgetry. If the kids are along, it’s got a dedicated pocket for it in my pack, with extra batteries. The point isn’t to abandon technology altogether. It’s to prevent the entertainment aspects of it from overshadowing the greater outdoor experience. I’ll admit that balancing the organic experience with the digital isn’t always easy. It’s difficult for me to check my tech tendencies at the trailhead. If I’ve got a connection and I start using it, I tend to focus on it until my head is completely in cyberspace (though I of course remain in complete control). I faced such a temptation last month on a hike in the Deseret Peak Wilderness area. I was delighted when, after a 3.4 mile hike to South Willow Lake, I pulled out the smartphone and noticed I had full data coverage. I had made the hike with the Transcript Bulletin’s editor, Jeff Barrus and our sons. When we reached the lake, the boys happily waded into its shallows. The view of the 10,685 foot glacial cirque surrounding it was amazing. I sat down on a large boulder on the lake’s shore. My first thought: How cool would it be to post a Twitter update from up here! I fired up my web browser and feverishly navigated to the Twitter home page before finally catching myself, remembering Deseret Peak. I assured myself that I would thoroughly document the hike online, but later. Right now it would be, well, just wrong! I put the phone away and didn’t get it back out that night. And I didn’t even open my laptop until the next day. Funny how that worked. The following is the second in a 2-part series about my recent hike to South Willow Lake in the Stansbury Mountains. It appeared in the September 8, 2009 edition of the newspaper as a single feature, but due to its length I’ve decided to post it here in two parts. Mining Fork Road ends as the canyon opens into a bowl. The cirque, which is informally referred to as South Willow Peak, is constantly visible from this point. The trail continues toward it as a single track, passing through hilly meadows trod by grazing cattle (grazing is permitted in wilderness areas). pockets and tethering to my pack probably helped with that too. The boys did better on this final leg than we had anticipated. Whether their minds had finally synced with the terrain or their conversations about cartoons distracted them sufficiently from the trail, we couldn’t tell. When we finally reached the lake’s southern shore, the boys immediately waded in. Intent on building a raft, they began gathering driftwood while Jeff and I located his favorite camping spot. Bridger, Weston, and I would be hiking back down that evening. Jeff and Real would be spending the night. “This place looks the same as it did thirty years ago,” Jeff remarked. The lake was modest, but beautiful in its surroundings. Its waters were chameleon, taking on different colors at different angles. At surface level it reflected the forest green of the limber pines along its shores. Walking around the lake and over a hill, it ranged from olive to camouflage gray to deep blue. A large snowfield remained tucked in a deep recess of the cirque’s 1,500 foot escarpment. Long black streaks marked the paths of small seasonal waterfalls. The lake’s simple beauty had made the hike more than worthwhile. The boys forsook their raft building effort to build a fire in camp. Despite the grueling hike, they never sat down, choosing instead to scavenge for tinder and various other items to burn. When evening fell, they bristled at the thought of leaving the lake. 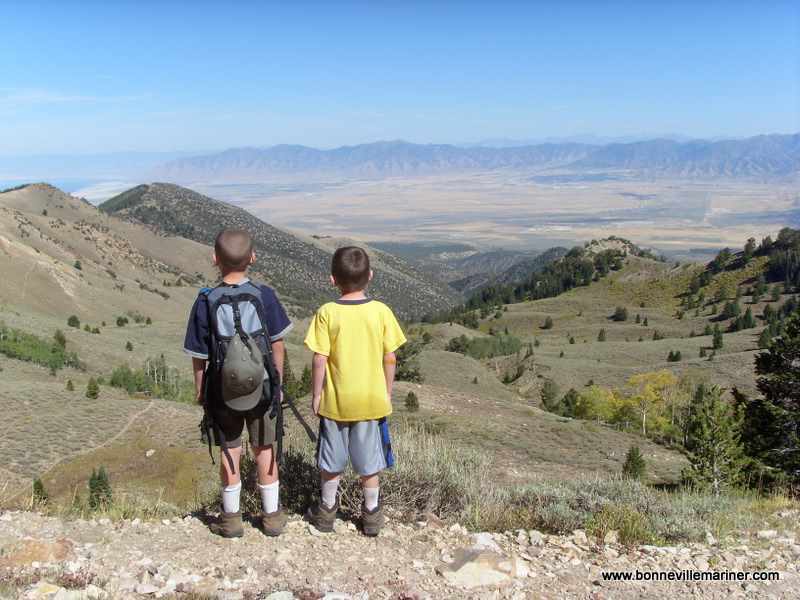 The descent offered continuous views of Tooele Valley below with the Oquirrh and Wasatch ranges in the distance. Dozens of grazing cattle watched us from the meadows. Though the forest was draped in shadow, the bright daytime sky above its canopy made created a strange, almost eerie contrast. Back at the trailhead, the boys seemed none worse for the wear, their enthusiasm for the lake completely overshadowing thoughts of the difficult hike. Darkness fell as we packed up the car. A certain crispness in the air reminded me that autumn was on its way. We probably won’t make it up to the lake again this year, but it’s ok. The giant cirque and its chameleon pool have existed for millennia. It will still be there next year. Click here for part 1 of this story, or here to read the whole thing in the paper. How’s that for a long title, huh? The following is part 1 of a 2-part series about my recent hike to South Willow Lake in the Stansbury Mountains. It appeared in the September 8, 2009 edition of the newspaper as a single feature, but due to its length I’ve decided to post it here in two parts. It’s evening in the quiet canyon. A squirrel darts across the narrow dirt road, taking watchful refuge in the rocks of the dry streambed beside it. Tall pines sway slightly in a breeze undetectable at trail level. The sun has fallen behind the broad glacial cirque that towers at the canyon’s head, its rays vacated, supplanted now by shadow. From the meadows at the end of the Mining Fork Road, the view of the unnamed 10,685 foot monolith is arresting. It’s also downright deceiving. Because having both climbed and descended its approach today, your legs and feet know it’s much further away than your eyes perceive it to be. Nestled at the foot of the cirque is a small alpine lake visible only from its shores. Unlike the massif that cradles it, this glassy pool has an official name—South Willow Lake. If Deseret Peak and its neighboring summits are the crown of the Stansbury Mountains, South Willow Lake is its jewel. 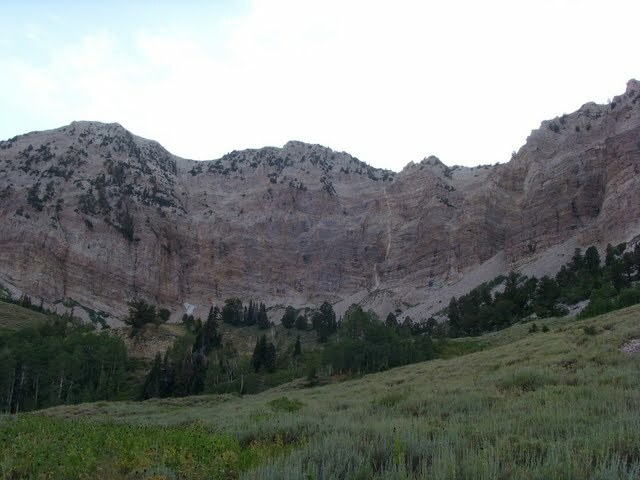 The peaks and lake are part of the 25,212 acre Deseret Peak Wilderness, created in 1984 by the Utah Wilderness Act. Among the primary goals of its establishment were the preservation of the land’s wilderness character, protection of watersheds and wildlife habitat, encouragement primitive recreation, and the promotion of physical and mental challenge. Camping, hunting, backpacking, and horseback riding are allowed within wilderness boundaries, but some restrictions apply. Commercial guiding and outfitting are prohibited. Mechanical transport of any kind is also prohibited. This includes everything from bicycles to motorized vehicles of any type. Two major routes lead to South Willow Lake. 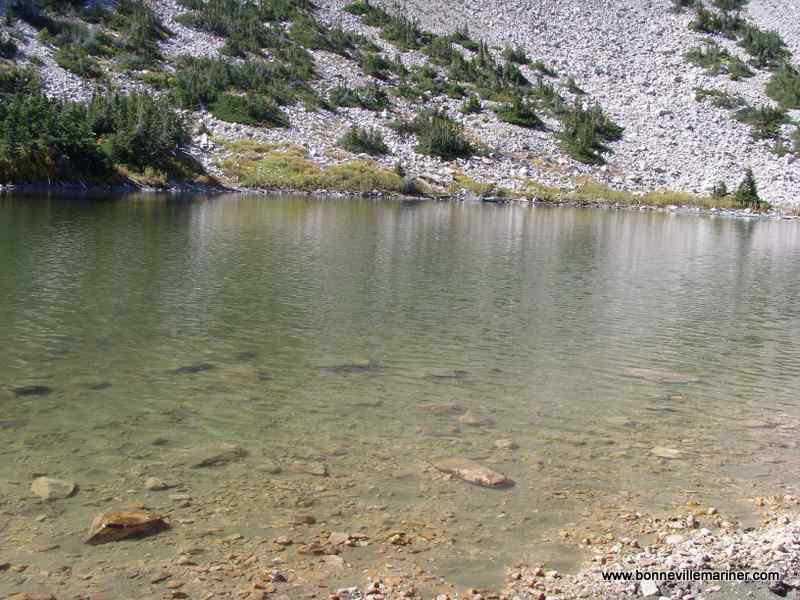 The more publicized of the two reaches the lake via the Mill Fork Trail and Pockets Fork in South Willow Canyon. This hike is 7 miles round trip with 1,630 feet of elevation gain. The second, more direct route is slightly shorter and considerably steeper. It begins at the Medina Flat Trailhead in South Willow Canyon and cuts over a ridge into Mining Fork, where it follows Mining Fork Road and trail to the lake. This hike is roughly 6.8 miles round trip with 2,540 feet of elevation gain. Last weekend the Transcript Bulletin’s editor, Jeff Barrus, and I hiked to the lake with our sons along the latter route. 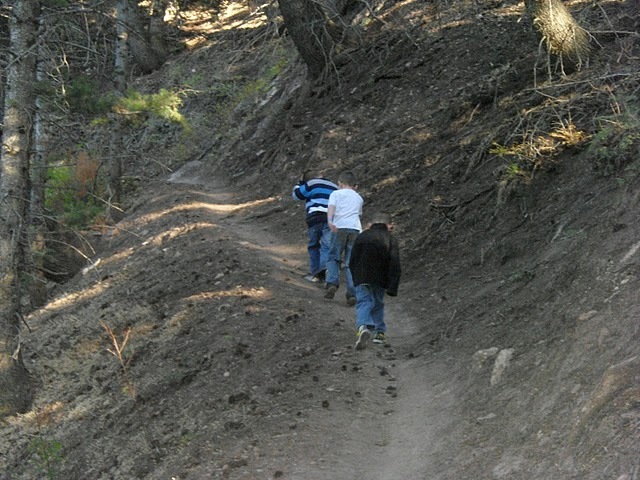 For Bridger (8), Weston (6), me, and Jeff’s son, Real (8), this trek would be a first. Jeff had been hiking to the lake since he was in his teens. He relished memories of care-free days and nights on the lake’s shores and was excited for Real to experience this rite of passage. We got a mid-morning start from the Medina Flat trailhead. 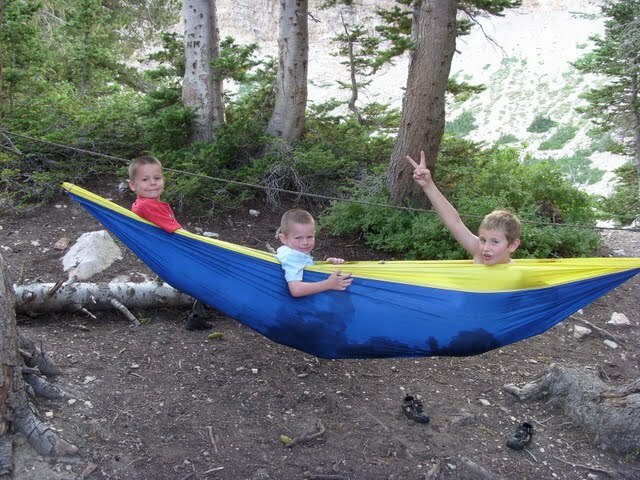 Jeff and I knew the hike would probably take longer than normal because the boys are so young. They began to prove us correct when they stopped about 100 feet—again at about 150 feet—then again at about 200 feet past the trailhead—trying to catch lizards and grasshoppers. After about 1/3 mile, the Medina Flat trail met Mining Fork Road, a slender double track that Forest Service employees speculate was blazed during World War II, since most of the ore taken from the mines went toward the war effort. The road traces the canyon bottom through stands of fir, spruce, and aspen, passing the tin roof sheets and deteriorating planks of collapsed mining cabins along the way. Steep canyon walls and dense vegetation gave this stretch of the hike a certain tight, though not claustrophobic feel. Because the road climbed steadily on a moderately steep grade, we stopped often to rest. Early on, the boys spent these pit stops chasing each other down and back up the trail and lobbing boulders—the bigger the better—into the stream bed. Only after the first couple miles did they begin to comprehend the concept of conserving energy. Stay tuned for part 2 tomorrow, or check out the full article and Meagan Burr’s excellent photos of the lake at the Transcript Bulletin’s website. The last major migration of Painted Lady butterflies through Tooele County ended in 2005, but the hundreds of colorful Lepidopterans flitting around the crest of Deseret Peak apparently didn’t get the memo. Their abundance added a comical flair to the utopian atmosphere on the 11,031-foot summit. The dozen or so climbers shooting the breeze atop the quartzite platform ran the gamut from young idealist to seasoned scoutmaster, casual hiker to gear-decked pro. If country roads make neighborly drivers, tough climbs and high elevations make outright pals of otherwise unacquainted mountaineers. The above is an excerpt from the last article in my series on Deseret Peak. Click over to the TTB to read the full story.